class="post-template-default single single-post postid-340752 single-format-standard group-blog masthead-fixed full-width singular wpb-js-composer js-comp-ver-5.7 vc_responsive"
The final 2017/2018 marketing year’s numbers are out – and for the second year in a row, the United States has set a new record for exports of feed grains and co-products, led by higher corn and ethanol shipments. Overall, the United States exported nearly 120 million metric tons of feed grains in all forms (GIAF), translating into roughly 4.75 billion bushels or a third of U.S. production. 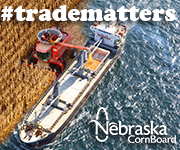 The marketing year’s exports increased six percent or 6.5 million tons (256 million bushels) above last year’s record-setting levels. Southern neighbor and trade agreement partner Mexico topped all other markets in GIAF imports, with total marketing year shipments growing 6.3 percent year-over-year to a new record of 25.2 million tons (almost 1 billion bushels in corn equivalent). By category, Mexico ranked as the largest buyer of U.S. corn, barley and dried distiller’s grains with solubles (DDGS), with sales in each category increasing from the prior year. Japan was the second largest overall GIAF market overseas in 2017/2018 with shipments roughly unchanged from last year at 16.9 million tons (665 million bushels). Japan ranked as the second largest buyer of U.S. corn and U.S. sorghum, the third largest buyer of U.S. barley and the ninth largest market for U.S. DDGS. South Korea rounded out the top three overall importers, increasing purchases of U.S. feed grains and co-products by 11.8 percent to 9.33 million tons (367 million bushels) – a new record. Notably, South Korea ranked as second largest buyer of U.S. DDGS, the third largest buyer of U.S. corn and sixth largest buyer of U.S. ethanol in addition to significant sales of U.S. sorghum. The Council utilizes the feed grains in all forms calculation to help capture how important overseas markets are for U.S. feed grain producers by including both exports of corn, barley and sorghum and products made with them as inputs including the corn equivalent of co-products like ethanol, DDGS and corn gluten feed/meal as well as beef, pork and poultry meat exports. By category, U.S. corn exports increased six percent to 61.8 million tons (2.43 billion bushels). Corn exports to Mexico reached a record high of 15.7 million tons (618 million bushels), up nearly 13 percent over last marketing year. This year’s sales continue strong export growth seen over the last five marketing years despite uncertainty surrounding the negotiation of the U.S.-Mexico-Canada Agreement (USMCA), thanks in large part to the market access provided by the existing North American Free Trade Agreement (NAFTA) and the resulting well-developed North American supply chains and robust market development work by the Council and its members. U.S. ethanol exports surged 19 percent to a record 1.62 billion gallons (equivalent to 547 million bushels of corn), thanks to greatly expanded worldwide market development work by the Council and ethanol industry partners including Growth Energy, the Renewable Fuels Association (RFA) and generous support from state corn organizations. Recent successes are also aided by a competitively-priced product compared to those of other ethanol exporting countries as well as fossil fuel alternatives like MTBE (methyl tertiary butyl ether) and aromatics (benzene, toluene and xylene). Notably, this year’s export total surpasses the previous record of 1.37 billion gallons (equivalent to 490 million bushels of grain) exported in the 2016/2017 marketing year. The Council started promoting ethanol in the 2013/2014 marketing year and has quickly expanded the intensity and geographic scope of its market development efforts. U.S. DDGS exports also grew year-over-year, albeit at a slower pace of 5.7 percent, with increased purchasing by four of the five top buyers for the year. 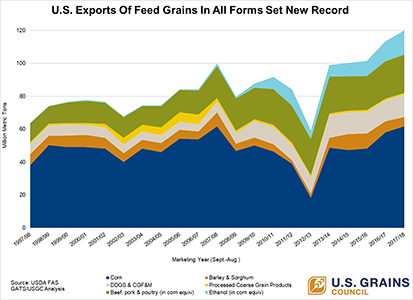 Each of the top four buyers – Mexico, South Korea, Turkey and Vietnam – purchased more than a million tons of U.S. DDGS in the 2017/2018 marketing year, indicating continued strong global interest in the feed ingredient despite a steady decline in Chinese purchasing since 2013/2014. Despite continued trade policy challenges, China remained the top buyer of U.S. sorghum with 4.2 million tons (165 million bushels) in sales in 2017/2018, largely sold before tariffs were enacted that continue to inhibit purchasing. Overall, sorghum exports were down nearly 14 percent year-over-year at 5.16 million tons (203 million bushels), but several smaller markets did increase purchases, including Japan, Sudan, the European Union (led by Spain), Somalia and South Korea.